Before I left I was determined to get all those boxes of scraps sorted into piles and stored correctly. It took hours, and I was more than a little sick of it by the end, but I persevered. 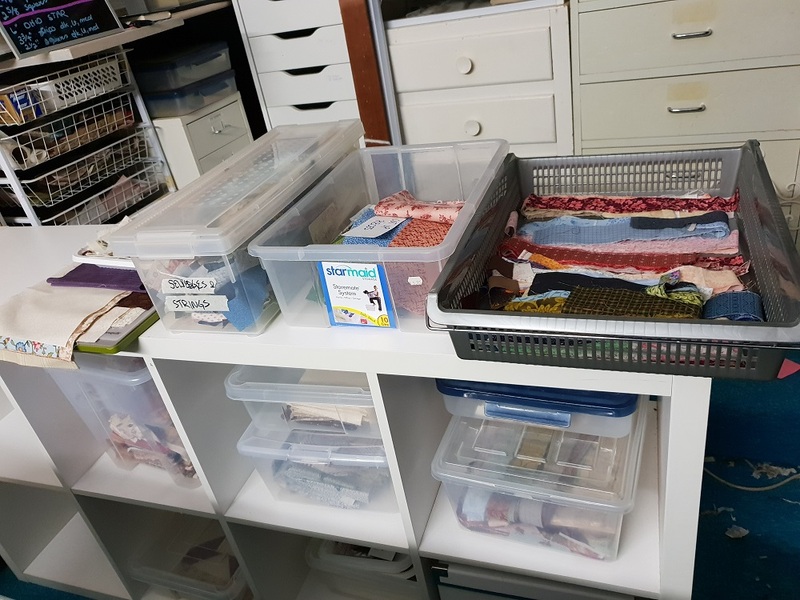 I reduced the containers to this; 2 boxes of genuine strings, and two boxes of pieces to send through the Go Cutter and cut into strips straight away. There were lots of small pieces that I couldn't decide on right away, so they are now stored in those wire baskets against the wall, waiting for me to come up with a project to use a few of them. 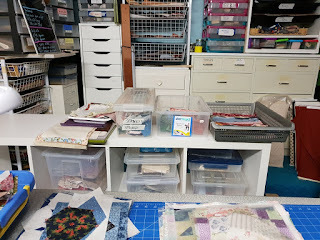 I stopped using Bonnie's Scrap User system a while ago, but recently it's occurred to me that it would be good to stack the strip drawers again. Not with 2.5"strips, because I rarely use that size, but the 3.5"and 1.5" drawers would be really useful. I seem to use those sizes all the time, and it would be great to have a stock of strips at hand. The 1.5" strips can be cut with the Go Cutter, and I will use the Shape Cut to do the 3.5"ones. After I'd cleared the surfaces I tipped out two huge tubs of orphan blocks, and tried to stocktake what I have. A LOT, is the answer. Most blocks aren't orphans as such. 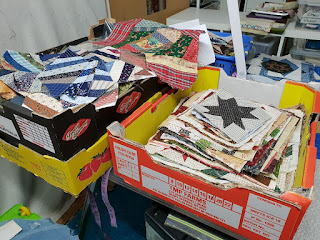 I always make too many blocks, so I can pick and choose what goes into the finished quilt, but I didn't realize how much of a habit it was until I saw them all in one place. Some blocks are singles, but most are multiples. How many quilts are in this bunch? I sorted them all into piles, then bagged them in plastic bags with a note saying how many blocks, and sometimes the size. 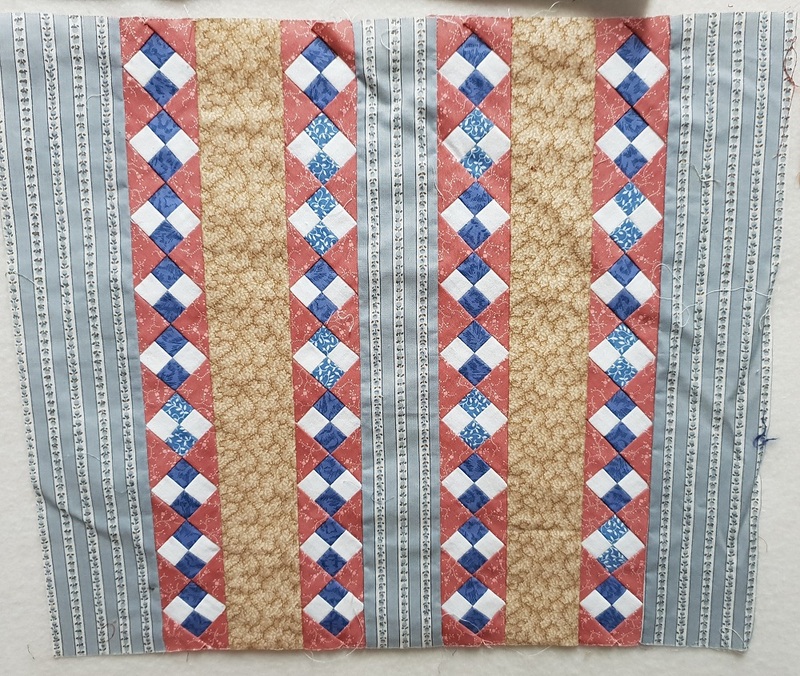 It took hours and hours, and I can only wonder at what makes me make 7 extra blocks for nearly every quilt. I guess I must like sewing them, if I have that many spare. The yellow box on the left contains the blocks with the most multiples, the black box is small blocks and units that I can build bigger blocks out of, or use as fillers if I do an Orphan quilt. The orange box is all the single blocks. It doesn't look like much, but it's a big stack. Not in this photo are all the really big pieces, that measure around 24"square. I can use them as the centres of medallions, or finish them as small quilts. I'll pull them out later when I have a bit of spare time. And I found two small pieces, that are already finished. This one used to be in a frame, but I took it out to quilt it and never got round to it. It's all fussy cut from one border stripe fabric. 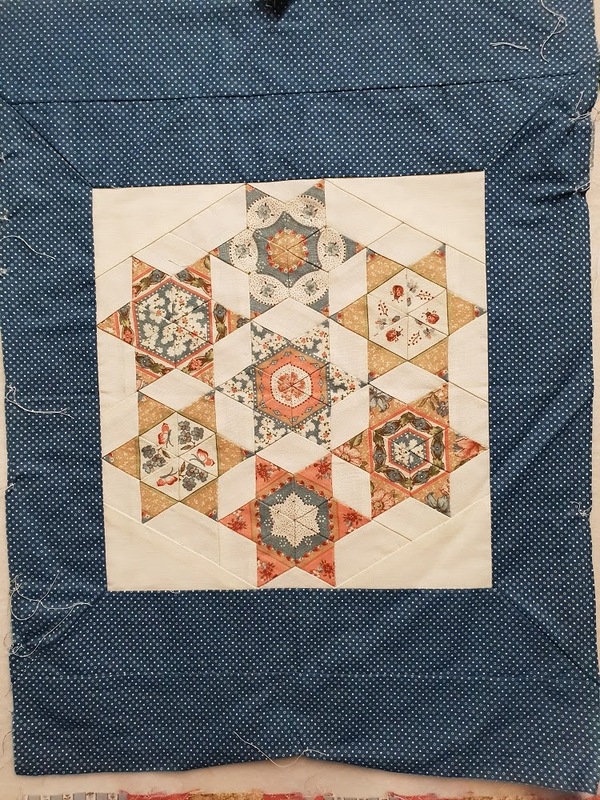 I might just put it back in a frame, I don't know that quilting would actually enhance it. 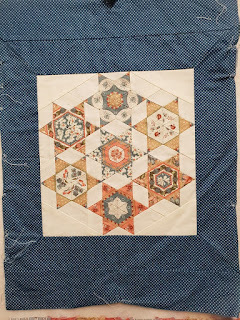 This one is a miniature copy of a quilt, from an English book I think, I'll have to rummage around and find it. The little four-patches are only an inch across, I had fun with this. It will definitely benefit from being quilted, and displayed on a doll's bed. It will be an afternoon's work to get this finished. Strange how some things just never get dealt with, until finally it's done in no time at all. You have lots of goodies in your sewing room. It is good to take inventory from time to time to see what you have. I am doing the same, but I have a feeling my process will take longer than yours. Sweet mini's, they would both look great with quilting in the borders....but I guess your to be quilted pile is as big as everyone elses. 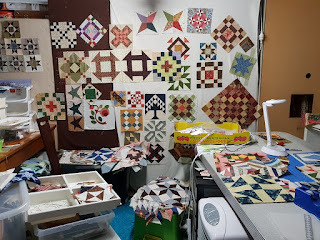 I am guess some sampler or lap quilts are in the works with all those left over blocks, enjoy. I had to laugh because I obsessively count blocks so I won’t have to make any more than I need for a quilt. I have very few orphan blocks around here!